Kevin Cooper was convicted of the 1983 murders of the Ryen family and a houseguest in Chino Hills California, a city in the southwest corner of San Bernardino County. What came to be known as the Chino Hills Murders were exceptionally vicious and brutal: 4 people murdered using a hatchet, a knife, and an icepick. They sustained 140 wounds, 28 fractures, 2 severed fingers. There was 1 surviving victim, left for dead. The horrific nature of the murders risked putting the San Bernardino County Sheriff’s Department under close scrutiny by the local community and national media. This scrutiny risked exposing corruption within. Discovering that Kevin Cooper had been in close proximity to the crime scene after escaping from a nearby minimum security prison, Sheriff Floyd Tidwell deceived the media and local community by announcing there was solid evidence connecting him with the murders. This was not true. With this announcement, just four days after the murders, he successfully shifted the attention to the California Institution of Men prison, which was already embroiled in controversy. Kevin Cooper’s criminal background made him an easy suspect. He had escaped from the California Institution of Men and was hiding out in a vacant house next to the crime scene. Verification of his presence in that vacant house was the only piece of evidence the Sheriff’s Department had on Mr. Cooper when he was charged with the murders. Corruption in the San Bernardino County Sheriff’s Department is well documented. Officials in the department, under Tidwell’s command, knew what he was doing and kept quiet because that was the culture of the department: there was something for everyone as long as no one finds out. Constant security breeches and overcrowding at the California Institution of Men (CIM) were ongoing issues in the Chino Hills community in the years leading up to the murders. 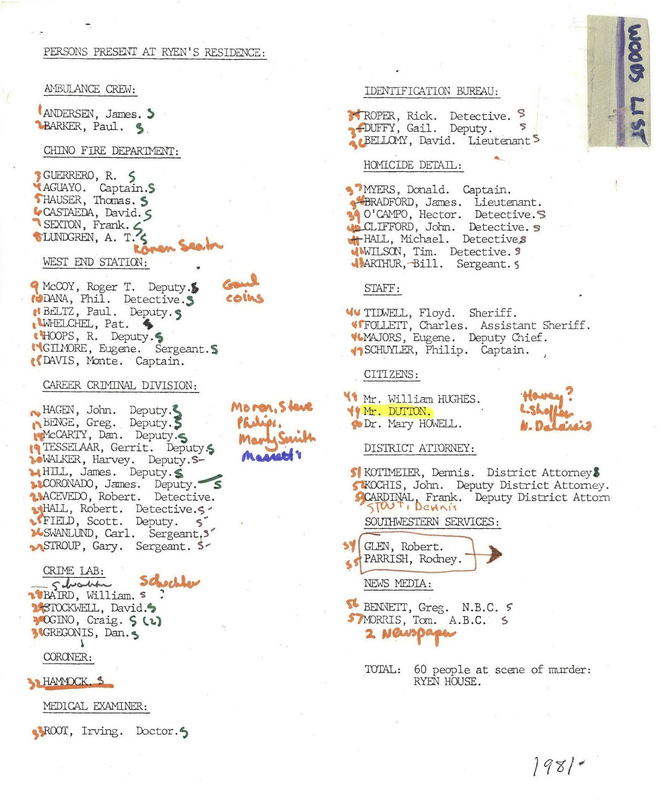 In early 1982, the State of California was actively legislating to expand the CIM along with several other state prisons. The outraged Chino Hills community successfully lobbied against this and the CIM expansion was removed from the bill. The CIM was seriously overcrowded, housing one third above capacity. There were chronic escapes, with a total of 22 that year. 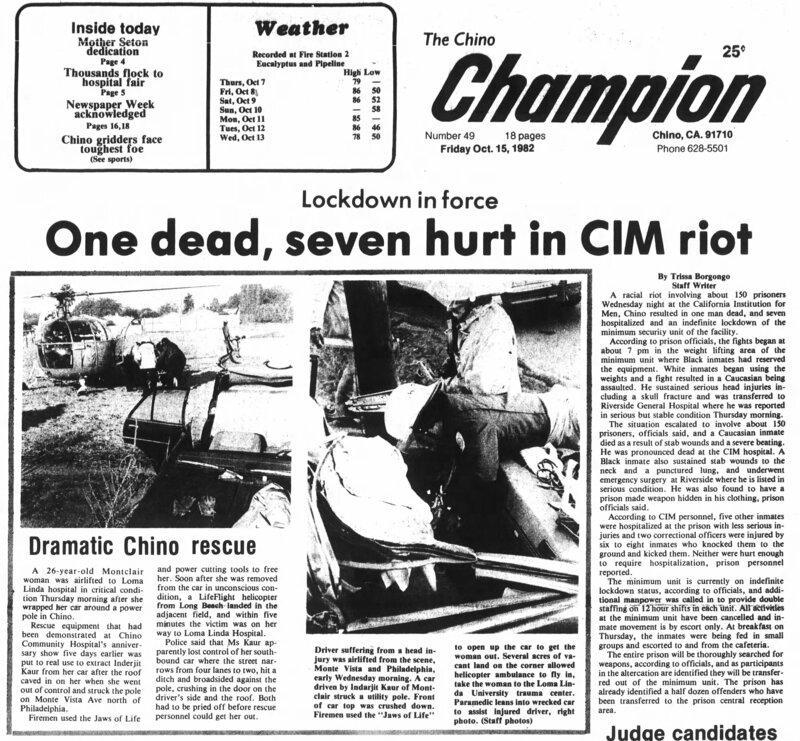 In October, there was a race riot at CIM that killed 1 prisoner, wounding 7. The CIM is five miles from the Ryen’s house. On Thursday June 2nd 1983, Kevin Cooper escaped the CIM and spent several nights in a vacant house adjacent to the Ryen’s. He was one of three escapees over that weekend. On Sunday June 5th 1983, the Chino Hills Murders were committed. Sheriff Floyd Tidwell heads the investigation. On Wednesday June 8th 1983, Kevin Cooper’s fingerprints were identified in the vacant house adjacent to the crime scene. The same day, the crime scene was ordered dismantled and taken to a warehouse. Lacking adequate air conditioning, the warehouse reached temperatures up to 120 degrees – effectively destroying any further collection of forensic evidence. On Thursday June 9th 1983, Sheriff Floyd Tidwell held a press conference saying they had “good, solid” proof that Cooper was at the scene of the murders. This was not true. Mr. Tidwell’s definition of the “the scene” encompassed the area surrounding the Ryen’s house, including the vacant house. As an experienced officer of the law, he knew this statement was misleading and thereby intentionally cast Mr. Cooper as a probable suspect. Then, without having him in custody for questioning, without evidence linking him to the actual crime scene, without a motive, Sheriff Floyd Tidwell announced that Kevin Cooper acted as the sole assailant and charged him with the Chino Hills Murders. With this announcement, Mr. Tidwell successfully shifted focus away from corruption at the SBCSD. There was no turning back for the investigation; all evidence would need to corroborate this account because, with this announcement, the local community had passed their own judgment on Kevin Cooper.